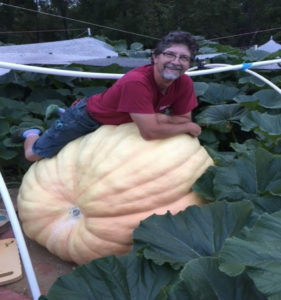 “Every year I compete in a contest with a group of friends to see who can grow the biggest pumpkin. Our pumpkins all come from the same generic pack of Atlantic Giant seeds. These past few years I’ve always placed second in the contest, losing each time to a particular rival who shamelessly boasts about leveraging his resources as a commercial farmer to win our contest. 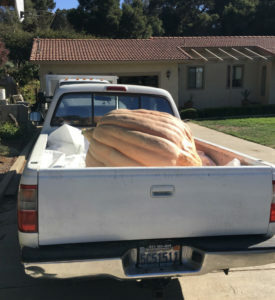 Bitter about losing by a painfully small margin two years in a row, I spent the off-season scouring the internet for any giant pumpkin knowledge that might give me an edge on my competition. I stumbled across a post on the BigPumpkins.com message board that was seeking pumpkin growers in my area to test a new, uniquely formulated brand of liquid “protein-hydrolysate” fertilizer. With nothing to lose, I replied to the post and before I knew it, there was 20 gallons of liquid fertilizer sitting on my door step. Much larger and greener new leaf growth. The increased presence of helpful insects. Anyone whose grown Atlantic Giants before will tell you that the weeks just after pollination are the funnest and most nerve wracking time of the season, as you witness your pumpkin grow from the size of a baseball to the size of beachball in the matter of just a few days. 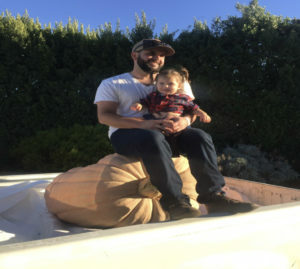 With the main vine on my experimental plant measuring at over 12ft in length, I was able to successfully pollinate a pumpkin two weeks ahead of the control group plant, meaning that by the time my control group plant was ready to pollinate, I already had a 100 Lb pumpkin on my experimental plant. A mere 30 days after pollination, I already had pumpkin on my experimental plant larger than any pumpkin I had ever grown, at well over 200 Lbs. Over the next 60 days I continued to see rapid and consistent growth on my experimental pumpkin, to the extent that I had to taper back my fertilizing and watering regiment in fear that my pumpkin might be growing too fast and split open. With my pumpkin still in tact, and the season coming to an end, I knew I had something far bigger than anything that I or my friends in the competition had seen before. I’ll never forget the look on the face of my friend who had beat me in the contest two years running, when he first laid eyes on my colossal pumpkin. Although, it was obvious that I had won, we did the weigh off anyway and my pumpkin clocked in at 464 pounds! With my rival coming in second place with a 189 pound specimen. The plants are starting to recover from the hail damage and the pumpkins are showing signs of “potentially” growing pretty big. Still guessing that the extreme damage that the hail caused will have an impact in the end but probably won’t know that for another month. 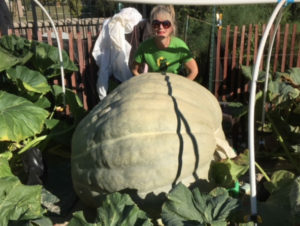 The bigger pumpkin (the 2066) currently is estimated at around 180 lbs. and has been gaining about 20-25 lbs. a day for the past few days. By next week it should be gaining 30-40 lbs. a day, if not, it will likely not get much bigger than 1300-1400 lbs. 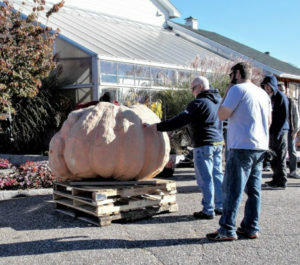 The smaller pumpkin (the 1694) currently is estimated at around 32 lbs. I’m predicting that this pumpkin in the end will do better than the 2066. It is one of the biggest pumpkins I’ve had at 13 days after pollination and the plant is really taking off. I’ve finished the first 2.5 gallons and am guessing that I will go through the next by the middle of August. Using more as the plants are getting bigger and the pumpkins are pulling a lot of nutrients. Received the fertilizer on Tuesday, thank you very much! I have to say that was the best packaging that I’ve ever seen on any liquid product that I’ve ordered. After running out of your product last week and then having 5 days of heavy rain I thought I would share an observation. I believe that I mentioned to you that we have a lot of dear in our area and that in years past I’ve always run an electric fence to keep them out but this year I decided to try it without it. I have not had a dear in the garden all summer until last week after stopping the use of your product followed by the week of rain. Fortunately the doe and it’s two fawns did not eat anything and moved out without damage. Cannot say for certain that your fertilizer is what has been keeping them out but the timing of them coming in after I stopped using it daily is interesting. The pumpkins are still growing. The larger one is measuring to be a little over 1000 lbs. and the other one is just over 800 lbs. The pictures that I’ve attached show the pumpkins yesterday compared to 3 weeks ago. Considering the damage to the plants in late June I have to be pretty happy with the growth to date. Will be weighing one of the pumpkins tonight at the Deerfield NH weigh-off. This pumpkin should weigh somewhere around 1300 lbs. That would make it one of my smallest pumpkins grown in many years but considering almost all of the leaves were shredded off in late June with the hail storm that hit here it is actually bigger than what I would have thought possible. I am using a hydroponic setup. I am using a fertilizer mixture that consists of 1 oz of Origin 360, a tsp of calcium nitrate, a tsp of a certain tomato/vegetable fertilizer, and 1/2 tsp of epsom salt per 2 gallons. I have a 30 gallon reservoir they I mix this in and a pump set on a timer that waters the plants 4 times per day for 30 minutes each time. The results have been great but since I started adding your fertilizer they have been amazing! The plants that we are growing are 6 tomato plants(5 San Marzano and 1 Cherokee Purple) and 1 basil plant. The system was assembled and the plants were planted on April 20 and the plants were all 4″ tall at planting. As of today, our tallest tomato plant is exactly 10′ tall with the 5 others anywhere from 8.5′-9.5′ tall. All of the leaves on all of the plants are dark green and look very healthy. I planted several tomato plants in our garden the same day that I planted the hydroponic one and the garden plants are right at 4′ tall with many dying, discolored leaves from all of the rain that we have been getting. That’s not the amazing part though! As of today, the 6 hydroponic tomato plants have roughly 160-170 tomatoes on them combined. I have added bird netting to form a makeshift trellis system so I would have something to stake or tie the stems and branches to so they wouldn’t break from the weight. I have built the trellis as high as I can(about 17 feet) but I don’t think it will be high enough. Thanks again for allowing me to use your great product and I do still have plenty but I will let you know if I get low. The way these plant look I am expecting them to grow until cold temp kill them off, which shouldn’t be for another 4-4.5 months. It’s scary to think what size they will be by then considering how much they have grown in just 2 months. I really appreciate you allowing us to use your fertilizer. The tomatoes and basil are still growing and producing. I will probably take the tomatoes up this weekend since we are expecting cold temps but the basil is still producing as good as it was during the summer. I think you will have success with the fertilizer since it is a great product. We also grew a 43.5 lb Canteloupe(second largest ever grown in Alabama) using your fertilizer as part of our fertilizer mixture. I would estimate that we are harvesting a pound of basil every 10-14 days off of one hydroponic basil plant. I’m going to expand the hydroponic setup next year and grow peppers, different herbs, and cucumbers among other things. I know your fertilizer works great with hydroponic tomatoes and basil. “This year I grew 40 tomato plants for Giant competitive growing, 17 plants for eating, a Giant Pumpkin, a Giant Green Squash and the rest of my garden with a wide assortment of other vegetables. I did have quite a successful growing season. I set a new Indiana state record for Giant tomatoes at 5.42 pounds. I also grew 13 tomatoes exceeding 4 pounds & 18 more over 3 pounds. My Giant pumpkin was on a growth curve toward 1400-1500 pounds; unfortunately we lost it to a fungal infection. The Giant squash ended up at 908 pounds. State record is 914 pounds so we were kicking ourselves over what we could have done to get another 7 pounds! Both the Giant pumpkin & squash got Origin 360.